ECB81, D’Addario’s best-selling Flatwound bass strings, are known for their warm, mellow tone and smooth polished feel. Chromes deliver a deep, rich low bottom end which makes them the flat wound choice of Jazz, R&B and Pop musicians. Fits long scale basses with a string scale length of up to 36 1/4 inches. 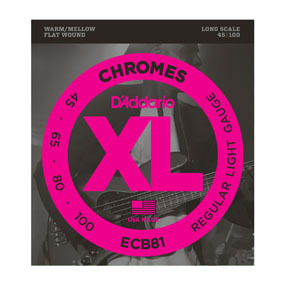 D’Addario XL Chromes are the industry standard in flatwound guitar strings. They deliver a round, full low end without losing punch, making them ideal for jazz players of all types. Wound with flattened stainless steel ribbon wire, then polished to unparalleled smoothness, it’s no wonder that XL Chromes are the world’s most popular flatwound strings.